What a perfect world it would be to find a home designed exactly to your family’s needs. This home would include the perfect master suite for you and your husband. A large yard for your 2 young daughters and would be easy for your Mom to navigate (who needs the assistance of a wheelchair) through any floor level of the home. Oh – one last thing – this home would also work within your budget (oops – sorry I had to say the dreaded ‘b’ word!). If this sounds like a ‘needle-in-a-haystack’ in this price-escalating, red-hot Columbus Ohio (or almost anywhere in the country for that matter) real estate market, you know the challenge Jennifer and Greg Lestini were dealing with when they decided to look for a move-up home 1 ½ years ago. Jennifer and Greg did not want a ‘cut-out-of-a-mold’ open floor plan home blown out by Crank-It-Out-Builders-Inc. (OK – just a bit of a made-up-name here). They wanted a home with character, a sense of style, with tradition, all on a nice lot. However – there was one big catch. This home’s design must not only live well for a super-busy 2 working- couple, 2 young daughters and 1 devoted Grandmother – be completed at a price point which made sense. This was not going to be an easy find. Their patience and persistence paid off when they fell in a love with a 1928 built classic home in the tree-lined Columbus suburb of Bexley Ohio. The challenge was This Old House was in no-way a perfect solution for their family. It would require a large-scale renovation to realize their vision. Fixing up This Old House to become This Beautiful Home was not going to be a simple (as a matter of fact some work is still going on!). 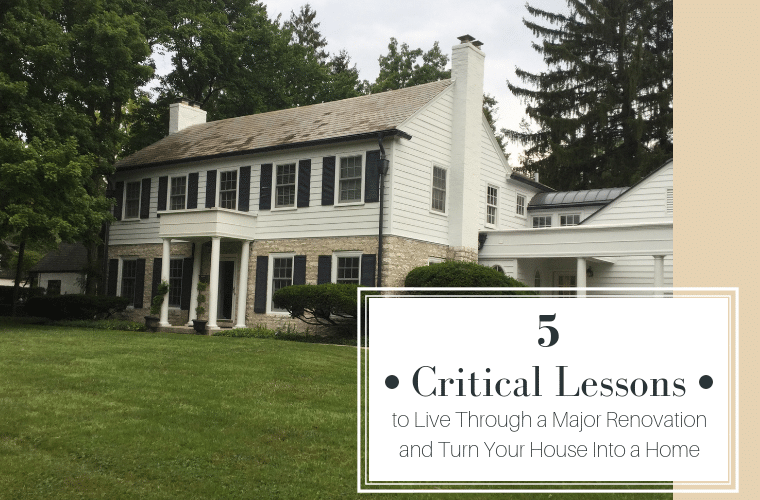 In this article I’m going to share with you the critical lessons Jennifer and Greg learned while living (literally) through the transformation of their Bexley home. An extensive renovation is not the path of least resistance. However, as you’ll see from the images below, remodeling (eventually) has its privileges (provided you don’t kill your spouse through the intermediate chaos). Let’s learn from Greg and Jennifer how to make it through a major renovation. While the lure of a new home with an open floor plan might be ‘the thing’ for some people, Greg and Jennifer fell in love with This Old House. The intimacy and traditional design of a classic center hall colonial with a winding staircase greet you at the front door. They loved the spacious hard – a perfect place for their daughters to hang out. They loved the character and decorative moldings. However, some of the ‘guts’ of the home where not going to work. For example, the remodeled master bathroom below and a master closet (still in the throes of completion) replaced a tight Jack and Jill bathroom and tiny closet. 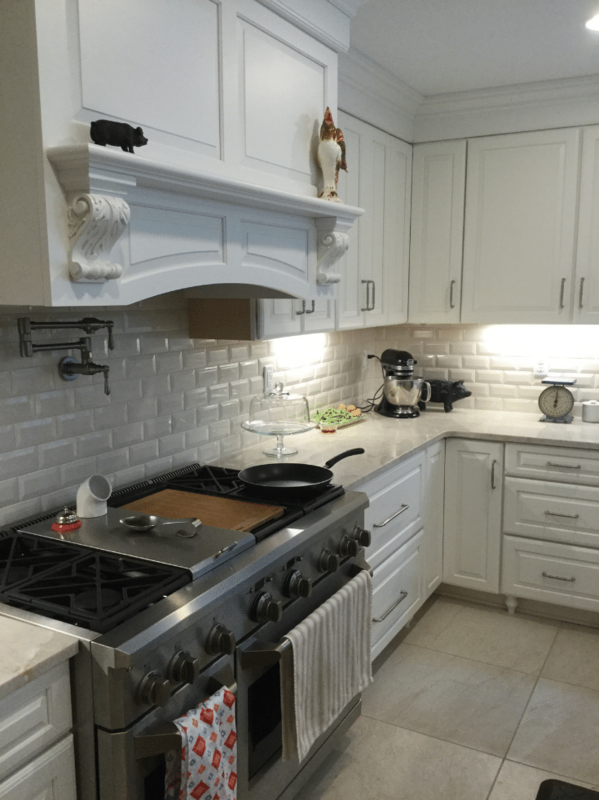 The kitchen was old and dated and needed to be redone. The sun room was not structurally sound. There was no mudroom or entryway to be found. Taking a risk buying your version of This Old House can quickly turn into a frustrating money-sucking experience like a scene from the movie The Money Pit. You need to go into the renovation process with your eyes-wide-open. Since neither Jennifer or Greg are licensed architects, building designers or contractors – they wanted to make sure they didn’t bite off a bigger project than they could financially chew. They smartly brought in two trusted advisors- architect/designer Pete Foster (of Pete Foster Residential Design) and Tom Presutti (of Presutti Remodeling). What Jennifer and Greg knew – is it’s a baaaaad idea to go into a major renovation blinded by rose-colored glasses. You could end up draining your wallet before you’re able to complete the job (yes – this has happened to lots of people over the years). Be smart, get architectural, design and construction input BEFORE you let the ink dry on buying a home which needs a major renovation. Out of the box (or out of the store) solutions can be beautiful (and save you money) …. when they work. However, if you buy something which doesn’t fit – or take full advantage of your available space – it can be a big waste of money (no matter how ‘cheap’ it is). 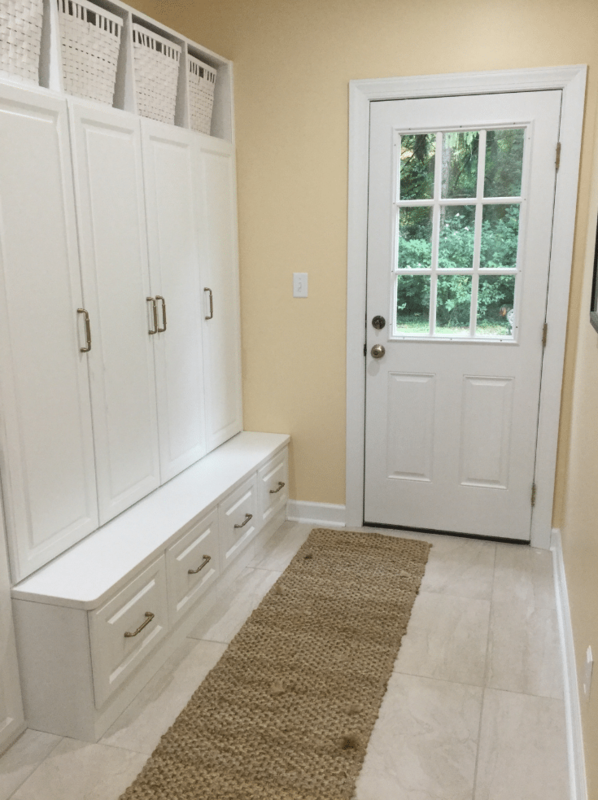 In their renovated home Jennifer and Greg wanted a mudroom to keep shoes, book bags, coats and cleaning equipment neatly stored away. 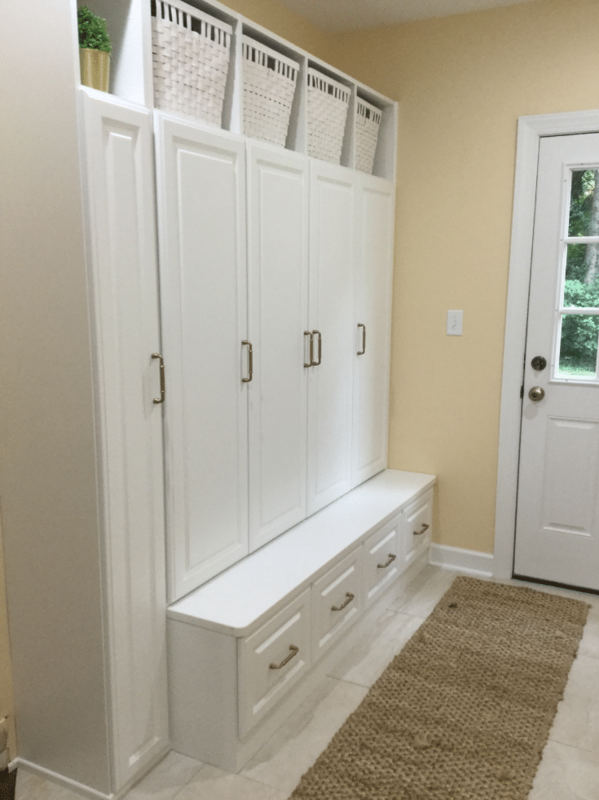 To accomplish this the back of the home was bumped out, a doorway to the backyard was added with a new mudroom storage area. This mudroom cabinetry system would have a cubby for each person (4 total), doors for each cubby and a thin area (just wide enough for the Dyson). These components needed to fit into an 88” wide space (which was 9’ tall). The couple first looked for a pre-made furniture-based solution. It would have been nice if an off-the-shelf solution existed. No such luck. That’s when they concluded a custom mudroom cabinetry system was the right (and only) way to make this happen. The design below used classic Shaker style doors and drawers with 4 custom-sized cubbies (about 20 ½” wide) and a snug 8” wide space for the Dyson. Custom designed. It fits like a glove. 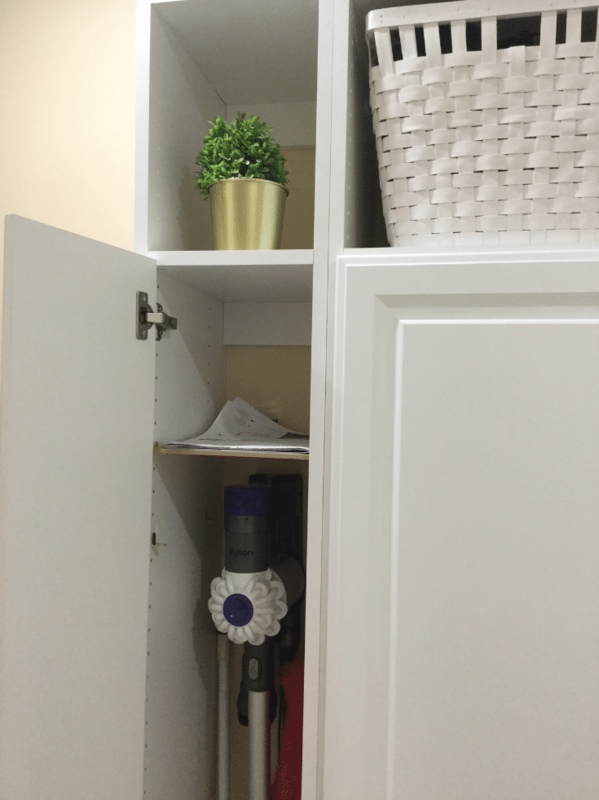 In the words of Johnnie (Mudroom Storage Expert) Cochran, “If the standard system don’t fit, you must acquit.” Sometimes the custom solution is THE way to go. While your tax planner may see your home’s ‘value’ as an ‘asset’ on a spreadsheet and be a source of financial deductions – I will make the argument this is NO reason to buy a home (especially a home which will require major renovations). Yes – as your tax planner says a house is an asset. However, a home is much more. A home is about love, it’s about relationships, it’s about good times with your friends, your sister, your brother (even if he’s a bit crazy like mine! ), your family and friends. If you’re a young girl (like Greg and Jennifer’s 2 daughters) a home is also meant to be enjoyed with your Grandmother. After all they’ll love you like crazy (and leave the messy parenting and discipline stuff to your Mom and Dad). However, problems can occur if the home is not inviting for Grandma (in this case to Jennifer’s Mom who uses a wheelchair). Does the home work for her if she can’t tuck the girls in bed (which is on the second floor)? Greg and Jennifer wanted this home to work for everyone. Consequently, one way they made this ‘house into a home’ was by installing an elevator, so Jennifer’s Mom wasn’t limited to the first floor. The lesson to be learned is building a house, should be more about creating a home. A place for love. A place for memories. A place which includes everyone. 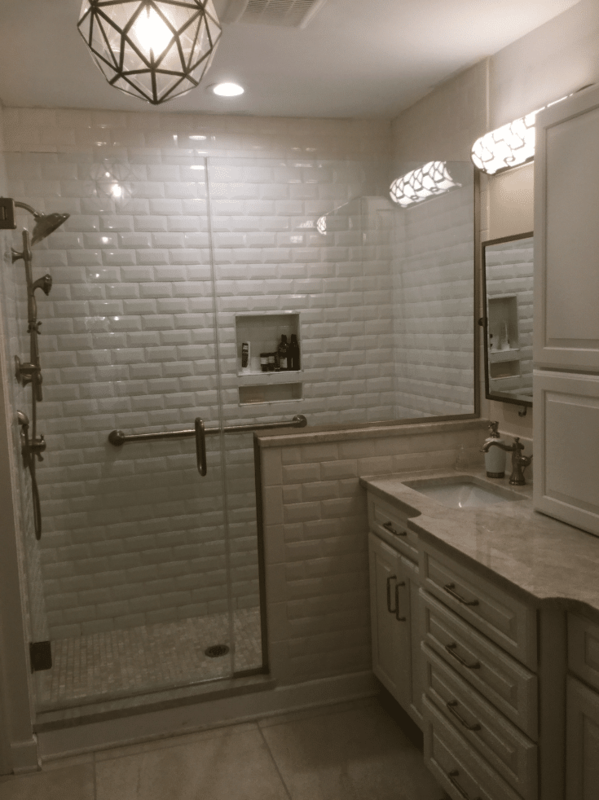 Don’t leave anyone out when planning your large-scale remodeling project. 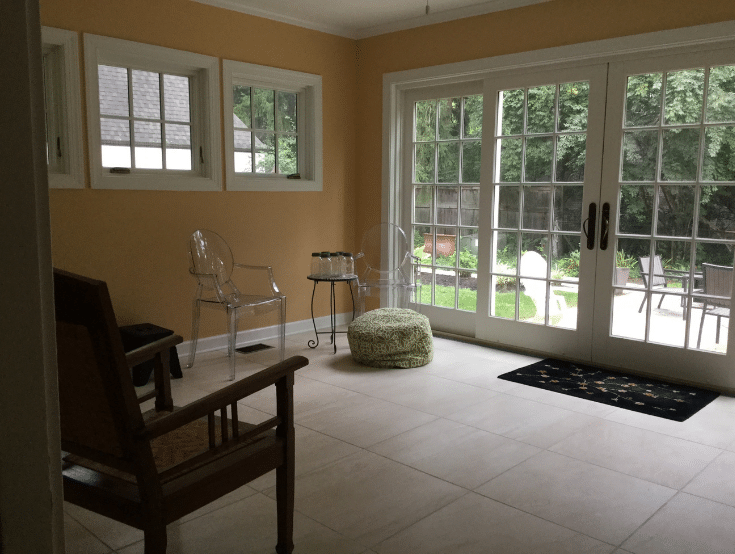 Critical Renovation Lesson #5 – Surround yourself with good people. Learn to communicate more. When I visited this home originally (I was looking at designing a mudroom storage unit and possibly a custom closet) and met Jennifer at the site I knew they would have their hands full. As a matter of fact I thought to myself – I’m not sure my wife Rose and I would be up to the challenge of a project this big. Given the number of rooms being remodeled (many happening simultaneously) I thought it would be smart to finish these critical lessons by getting the input from a couple who has lived through (and not killed each other in the process I might add) a project of this size and scope. Here’s the words of wisdom Greg told me. Taking on a large-scale renovation of Your Old House is not a path to be taken lightly. As you can see from Greg and Jennifer’s story, it will take patience. It will take a team (of contractors, designers, good subcontractors). It will take help and careful planning. It may even take a dose of faith from time to time. However, there is a huge payoff at the end. When you’re enjoying the laughter and blessing of family and friends you can look back and say…. We truly did turn this house into a home! If you’d like to learn more about a custom closet and mudroom organization system and get a Free 3D design contact Innovate Home Org in Columbus at 614-545-6888. If you’d like to learn how to design your home for a major renovation call Pete Foster of Pete Foster Residential Design. If you’re looking for a large-project remodeling company call Tom Presutti of Presutti Remodeling. If you’re a Twitter fan please connect with me @Mike_Foti or my companies @InnovateHomeOrg or @InnovateBuild for information on home organization and interior design.